This tree is in the greenspace on the east side of 21st Ave. S. across from the entrance of the medical arts building. Red hickory leaves usually have seven leaflets (occasionally 5) and its mature buds are usually reddish, in contrast to the yellow buds of bitternut hickory (Carya cordiformes). The twigs are also more slender than the twigs of mockernut hickory (Carya tomentosa), another hickory with 7 leaflets. The bark is tight, unlike the shaggy bark of kingnut hickory (Carya laciniosa), which also typically has 7 (or 9) leaflets. 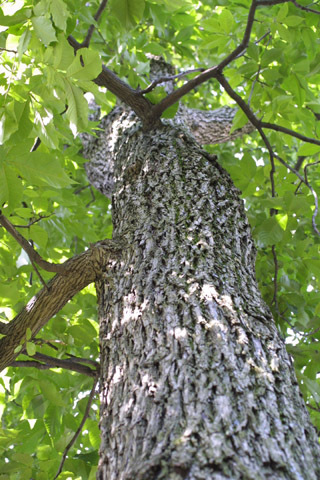 To systematically separate hickory species, see the key to hickories. The fruits of red hickory have a relatively thin husk and their nuts are good to eat. Red hickory is fairly common in middle Tennessee. However, it often hybridizes with other hickory species (such as shagbark hickory) and so it is sometimes not possible to classify individuals to species unambiguously. This is the only known red hickory on Vanderbilt's campus. This organism is a living specimen that is part of the  Vanderbilt University Arboretum  with the local identifier 1-714. Remarks: Mentioned in 1994 Trees of Vanderbilt book p.73.